Cardiff City manager Neil Warnock says he is already planning for next season after signing a new contract. Warnock signed his extension before Saturday's 2-2 draw with Fulham, which kept the Bluebirds 12th in the Championship table. Having already ruled out the play-offs this season, the 68-year-old has his eye on a promotion challenge in the next campaign. "I've been planning for weeks," said Warnock. "We've got opportunities now to pit our wits against a lot of good teams between now and the end of the season, and I want to see how we react now. "I'm still looking at one or two players - can I get better than them or not? Certain players are playing for their places at the minute. That's how it should be." Cardiff were second from bottom when Warnock succeeded Paul Trollope in October, and his arrival has transformed the Welsh club's fortunes. 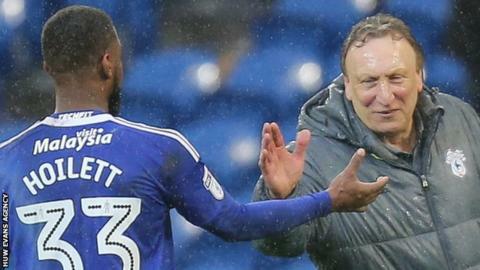 No team in the Championship has won more points than Cardiff in 2017 and, prior to Saturday's enthralling draw with Fulham, Warnock's men had won three games in a row. With 12 games to play this season and a gap of 12 points between his side and the top six, the former Sheffield United and Crystal Palace manager has dismissed the notion of reaching the play-offs this term. The next campaign, however, could be different, with chairman Mehmet Dalman saying he and owner Vincent Tan will give Warnock the financial backing to mount a promotion challenge. "We talked about a budget for the summer and the FFP [Financial Fair Play regulations] which I've got to help contribute to, which I've told them I can do certain amounts to help out," said Warnock. "Together we thought, if we all do our jobs right, it will give us a chance. "You can't say you're going to get promotion - all you can say is we'll have a good try at having a good season."